It is a source of joy and hope to begin this pilgrimage to the Baltic countries in Lithuania, which is, in the words of Saint John Paul II, “a silent witness of a passionate love for religious freedom” (Welcome Ceremony, Vilnius, 4 September 1993). I thank you, Madam President, for your cordial words of welcome in your own name and that of your people. In addressing you, I wish to greet in the first place the entire Lithuanian people, who today open to me the doors of their homes and of their homeland. To all of you I express my affection and sincere gratitude. This visit takes place at a particularly important moment in your life as a nation, for you celebrate this year the centenary of your declaration of independence. It has been a century marked by your bearing numerous trials and sufferings: detentions, deportations, even martyrdom. Celebrating the hundredth anniversary of independence means taking time to stop and revive the memory of all those experiences. In this way, you will be in touch with everything that forged you as a nation, and thus find the key to assessing present challenges and looking to the future in a spirit of dialogue and unity with all those who dwell here, careful to ensure that no one remains excluded. Each generation is challenged to make its own the struggles and achievements of the past, and to honour in the present the memory of all those who have gone before. We do not know what tomorrow bring, yet we do know that each age has the duty to cherish the “soul” that created it and helped it to turn every situation of sorrow and injustice into opportunity, preserving alive and healthy the roots that nurtured the fruits we enjoy today. Truly, this people has a strong “soul” that enables it to hold fast and to keep building! This is the prayer voiced in your national hymn: “May your sons draw strength and vigour from your past experience”, so as to face the present with courage. Throughout its history, Lithuania was able to shelter, receive and accept peoples of various ethnic groups and religions. All found a place to live in this land – Lithuanians, Tartars, Poles, Russians, Belarusians, Ukrainians, Armenians, Germans … Catholics, Orthodox, Protestants, Old Catholics, Muslims, Jews – lived together in peace until the arrival of totalitarian ideologies that, by sowing violence and lack of trust, undermined its ability to accept and harmonize differences. To draw strength from the past is to recover those roots and keep alive all that continues to be most authentic and distinctive about you, everything that enabled you to grow and not succumb as a nation: tolerance, hospitality, respect and solidarity. If we look at the world scene in our time, more and more voices are sowing division and confrontation – often by exploiting insecurity or situations of conflict – and proclaiming that the only way possible to guarantee security and the continued existence of a culture is to try to eliminate, cancel or expel others. Here you Lithuanians have a word of your own to contribute: “welcoming differences”. Through dialogue, openness and understanding, you can become a bridge between Eastern and Western Europe. This is the fruit of a mature history, which you as a people can offer to the international community and to the European Community in particular. You have suffered “in the flesh” those efforts to impose a single model that would annul differences under the pretence of believing that the privileges of a few are more important than the dignity of others or the common good. As Benedict XVI rightly pointed out: “to desire the common good and strive towards it is a requirement of justice and charity … The more we strive to secure a common good corresponding to the real needs of our neighbours, the more effectively we love them” (Caritas in Veritate, 7). 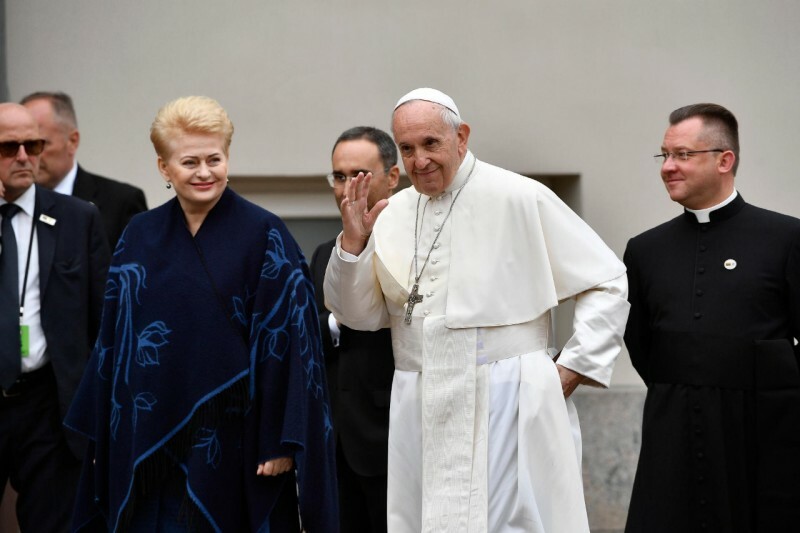 All conflicts presently emerging will find lasting solutions only if those solutions are grounded in the concrete recognition of [the dignity of] persons, especially the most vulnerable, and in the realization that all of us are challenged “to broaden our horizons and see the greater good which will benefit us all” (Evangelii Gaudium, 235). In this sense, to draw strength from the past is to pay attention to the young, who are not only the future but also the present of this nation, if they can remain attached to the roots of the people. A people in which young persons can find room for growth and for employment, will help them feel that they have a leading role to play in building up the social and communitarian fabric. This will make it possible for all to lift their gaze with hope to the future. The Lithuania of which they dream will depend on tireless efforts to promote policies that encourage the active participation of young people in society. Doubtless, this will prove a seed of hope, for it will lead to a dynamic process in which the “soul” of this people will continue to generate hospitality: hospitality towards the stranger, hospitality towards the young, towards the elderly, who are the living memory, towards the poor, and, ultimately, hospitality towards the future. I assure you, Madam President, that you can continue to count on the efforts and the cooperation of the Catholic Church, so that this land can fulfil its vocation as land that serves as bridge of communion and hope.